Corey Seager absolutely cannot be stopped, while Julio Urias starts to show exactly why he has been so hyped. Chris Anderson and Tom Windle continue to struggle with consistency, while Darnell Sweeney and Jesmuel Valentin deserve recognition for being steady all year. Hitters Of The Day: Joc Pederson (AAA) went 3-for-6 with his 14th homer and 13th stolen base. Teammate Alex Guerrero (AAA) went 3-for-4 with a triple and his 10th homer. This duo would continue to be a theme if … well … Miguel Olivo could’ve resisted trying to eat Guerrero’s ear. Pitcher Of The Day: Fabio Martinez (A+), the project I talked about last time with the plus stuff, showed his downside today, lasting only four innings and giving up five runs (three earned) while walking six. Tim Federowicz (AAA) collected three hits in four trips, including a walk. He was hot last week and started off well this week, but overall his OPS in AAA is down to .765 now. Corey Seager (A+) went 2-for-4 with his fifth homer and seventh error. 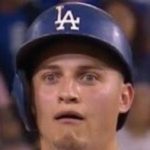 Going to be much more of Seager in this recap. Jesmuel Valentin (A) went 2-for-4 with a triple and is hitting well for a guy whose biggest question lay with his bat. Valentin’s slash is .274/.362/.402/.764 and he’s controlling the zone with a 22/27 BB/K rate. He’s also showing an eye for baserunning, going 11-for-12 in stolen base attempts, and I like this defense at second, especially the rate at which he’s adapted to turning two. Hitter Of The Day: Corey Seager (A+) went 2-for-4 with a double and his line on the year is suddenly .371/.419/.611/1.030. The power has come on of late, as you’ll see further down in this recap, but his talent is starting to shine through and he’s proving his late season struggles in 2013 were a combination of fatigue and luck. Seager will likely need to learn to control the zone better as he moves levels, as he’s still very aggressive, but he has time. Swing-and-miss is a bit of a concern considering how aggressive he already is in the zone, but again, he’s in his age 20 season and he’ll push to be in AA if he keeps this up. Pitcher Of The Day: Scott Barlow (A) is still marching back from Tommy John surgery, as he pitched six innings of two-run ball, walking one and striking out three. Barlow isn’t all the way back yet, but his control is returning and he’s starting to miss more bats as his stuff sharpens. I’m still waiting to see the same burst from his fastball, but he’s 21 and not even 100 innings into his comeback. Hitter Of The Day: Miguel Rojas (AAA) went 2-for-4, both singles. Nothing to be impressed about, and his line is only .279/.341/.336/.677. He’s also 25 and hitting in Albuquerque, but he can handle short, second, and third, so there might be hope for him yet in terms of an MLB shot in a utility role. Heck, if the Dodgers can deem Erisbel Arruebarrena‘s offensive performance sufficient for a call-up with plus defense, then anything is possible for Rojas. Pitcher Of The Day: Julio Urias (A+) went five innings of scoreless ball, walking none, allowing a single hit, and striking out five. Urias has been coming on strong of late and these are more along the lines of the performances we expected to see with more regularity. Still, he’s “struggling” and has 10 K/9 at 17 in high-A, and all his stuff is checking out as far as I’m concerned. Remember, he could be a junior in high school. Red Patterson (AAA) went seven innings of two-run ball, surrendering two solo homers among his seven hits allowed. Patterson struck out six and walked none, continuing to cement himself as the seventh starter for the Dodgers. Corey Seager (A+) went 3-for-4 with a double. Ho hum. Victor Arano (A) has had a rough go of it lately, but bounced back in relief today, striking out four and walking none in three scoreless innings. Hitter Of The Day: Darnell Sweeney (AA) went 3-for-4 with two doubles, a walk, and his fourth homer. He also played shortstop … where he made an error. But he continues to hit, and is currently putting up a .312/.412/.459/.871 line. Sweeney is flashing some pop with 16 XBH and patience with 29 walks, but needs to not strike out 20% of the time. Also, he has been caught nine times to just six stolen bases. Overall though, it’s still been an extremely positive year, as he’s handled the promotion to advanced pitching and then some. Sweeney’s defense will continue to be a question though, and he needs to work at it a bunch more. They continue to try him at short, but he’s been pretty consistently terrible there. His tools play much better at second, though I think that cuts into his MLB potential a great deal. His offensive profile might not be that of a first-division regular, so his defense could end up deciding his MLB future value. Pitcher Of The Day: Pedro Baez (AA) pitched another perfect inning, striking out one. Baez has strung together five scoreless appearances, where he’s struck out nine and walked three in five innings. Yimi Garcia and Baez actually look better than Paco Rodriguez and Jose Dominguez in the minors right now. Corey Seager (A+) went 4-for-5 with a double. Like I said: red hot. 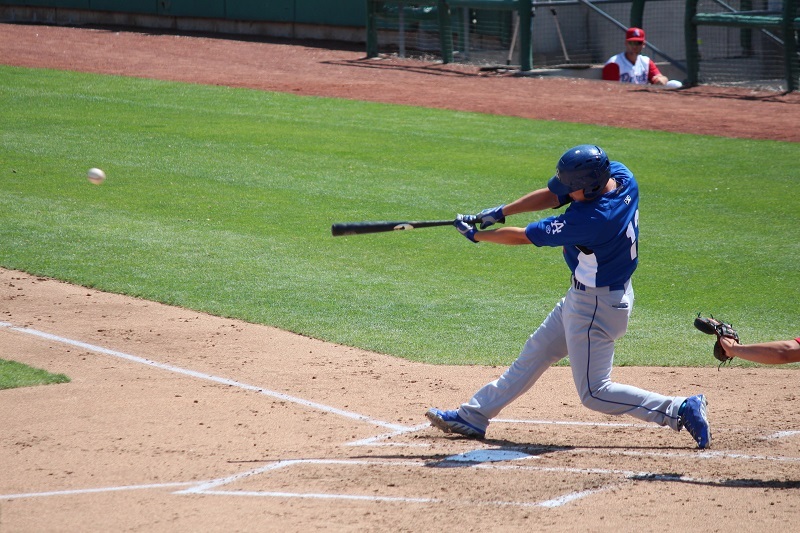 Hitter Of The Day: Joc Pederson (AAA) went 2-for-4 and slugged his 15th homer to go along with a triple. OPS is still a robust 1.089, and he’s walking 16% of the time, but the 27% strikeout rate could be a potential red flag. That said, he now has a .937 OPS against lefties, so the red flags against him are dwindling. Pitcher Of The Day: Tom Windle (A+) surrendered seven runs (three earned) and got knocked around for 10 hits in 3.2 innings. He struck out four and again showed his control was back with no walks, but he’s been way more up and down than I expected. Chris Reed (AA) allowed seven runs (six earned) on seven hits, including two homers. He struck out five and walked one in five innings, which makes this a rare outing where his control was fine but he just got hit a ton. Hitter Of The Day: Noel Cuevas (AA) started off the season hitting awful, but he went 1-for-3 today with a triple, and is now batting .364/.417/.485/.902 in his last 10 games. To give you an idea of his start, that run only ups his OPS to .570, but signs of life maybe? Pitcher Of The Day: Matt Magill (AAA) is apparently now a reliever, which makes me double down on what I said earlier about Patterson taking over as the reserve starter for the club. He pitched 1.1 perfect innings today, striking out one. Magill has now made three straight appearances in short relief, pitching 4.2 innings, allowing two hits, two runs … and walking four while striking out three. So essentially the same problems so far, just in shorter bursts. Jacob Rhame (A) is still an intriguing prospect to me. Not quite a sleeper and he’s still most likely org depth due to stuff that isn’t quite plus, but he has MLB potential at least. Rhame went two perfect innings today, striking out five to bring his K/9 up to 11. Hitter Of The Day: Jacob Scavuzzo (A) went 3-for-5 with a double. Scavuzzo is one of the guys I like because he’s one of the few in the lower minors that I think has at least above average MLB regular potential, but he’s been fighting it lately and currently is down to a .634 OPS. See, it’s a bit hard to find success when 38% of plate appearances end up in a strikeout or infield fly. That said, his walk rate continues to improve, so adjustments are probably being made against full season pitching after his hot start, and hopefully days like today get him going a bit. Pitcher Of The Day: Chris Anderson (A+) lasted just 4.1 innings, giving up five runs on eight hits, including a homer. He struck out eight but his ERA is now 5.96 and his performances have been all over the place. Sure, he’s striking out 11 per nine, but he’s walking five per nine and continues to get squared up better than he should given his stuff. Control is not good right now, and neither is his command in the zone, which leads to things like 11 hits per nine. Brian Cavazos Galvez (AA) … pitched and got an out to close a game. Might have a better chance to make the majors that way? Who knows? Corey Seager (A+) went 2-for-5 with his sixth homer. Glad this is becoming just another day in the life of Seager in the Cal League.